Isla Verde - through an Aussie tourist's eyes. I have only been to Isla Verde once. In November 2012 I visited and stayed at the block that is now being developed into a small resort. Facilities were basic, rural living, as the old house was still functioning. We slept outside on a bamboo bed, under a mango tree until it began to rain a little. That sent us indoors, but someone actually had to wake me to tell me it was raining. The night was so peaceful and the light rain was not cold. The trip from Manila was by coach, and from a small beach we were taken by small banca, to a bigger banca - the St Paul. I am an Aussie. I am also a sailor, with my own yachts in the Whitsunday Islands. But I have never seen anything quite like a large banca ferry. In any other country a banca would be called an outrigger canoe. St Paul was simply a huge canoe, with a house on top, and bamboo outriggers, tied on with fishing line. This was our transport from Batangas across the Verde Island Passage. The trip surprised me. The design of the banca makes it very good in choppy seas, and in a couple of hours we were approaching our destination. Once at Isla Verde, the first surprise is that there is not much wheeled transport. I saw one small motorbike. Everywhere else, people walked. The walk from the landing place to where the resort is now being built was pleasant. My first impression was that I had simply arrived at one of Queensland's beautiful Whitsunday Islands. In fact, that is exactly what it felt like after a couple of days. Same, beaches, same vegetation. I think the only difference was that on Isla Verde, the water is clearer, and there are people. Happy, smiling people to whom nothing is too much trouble. Everywhere I went i was greeted with smiles. Nobody looked at me as if I was a foreigner, the way it happens on some other countries. I was just encouraged to blend in, and join in. I immediately felt I could live here. Isla Verde is a pretty place and has beautiful views from many points on and around the island. There are walking paths connecting much of the island and walking over the island from one side to another is pleasant. The visitor passes through farm land, small settlements, and light forest. There is always something beautiful to see. The beaches are different on either side of the island. On one side the beaches are mostly made up of corral rubble, because there is so much beautiful coral reef, so close to the shore. Isla Verde has probably got similar coral and fish to Australia's Great Barrier Reef, but it is easier to dive and fish at Isla. On the other side of the island, the beaches are mostly normal sand. Local fishing boats can be hired to take the visitor around various beaches, and fishermen can be hired to take a visitor out on a fishing trip. I believe there is also a local dive operator. 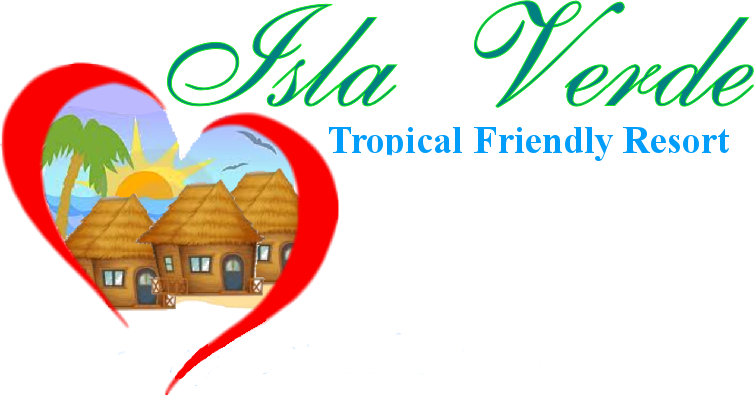 There have been many changes at Isla Verde since I was there, and I am looking forward to my next trip. Isla Verde is so easy to get to from Manila, and is so much more peaceful and relaxing than some other Philippine resort areas.